Once again it is that time Of the year that we of St. Stanislaus Memorial Post 1771 American Legion, along with many Pasts ‘Of Kings County, its Auxiliaries and Sans ‘Of the Legion Squadrons, will Honor its departed comrades at all Wars, its Membership, its Auxiliary and Community. This being our 19th Annual Memorial Mass. It will be held on March 23, 1969, at the 11:00 A.M. High Mass at St. Stanislaus Kostka R.C. Church. We will march from Our Past headquarters at Mc Guinness Blvd. to St. Stanislaus Kostka R.C. Church. After Memorial services, we will march throughout the Community, placing Wreaths at different Memorial Shrines, concluding the services at Our Post headquarters. I land the Membership of the Past ask the people Of the community to participate by displaying the American Flag, in memory Of Our Departed Comrades. This being the 50th Anniversary Of the founding Of the American Legion, we would like to mention same of its endeavors, in Americanism, Child Welfare, and rehabilitation of Veterans and their Families. In this Community and Kings County ‘Our Post is known far its participation in all of these programs. On behalf of our Post and Unit, I offer this, our 19th Annual Memorial Mass in Honor of our Post, Auxiliary, Community, and today’s young men who axe dying in the battlefields of Vietnam. At this time I would like to thank my Acting Chaplain, Teddy Sepanski as Chairman and all those who had helped in making arrangements, and all those who had participated in this Memorial Mass. John Lutz, Harold McCullum, Henry Ross. Also Past Commanders: J. Kozak, N. Stefanizzi, J. Nowinski, E. Brady, W. Golembieski, P. Wozniak, R. Fitzgerald, M. Justynowicz, H. Waloski, J. Brady, S. towickki, P. Rago, R: Fafalak; G. Weinmann. The Annual Carnival of St. Stan’s Memorial Post will take place three weekends, Sept. 13 -14, and 15; Sept. 20, 21 and 22; and Sept. 27, 28 and 29. This will be a different format this year. In the past the carnival was run for 10 days straight. Marcello Crescente will be chairman and the co-chairman will be Nicholas Stefanizzi. The doors in the new air-conditioned brick building will open at 6:30 P.M. There will also be outdoor amusements for the young and old alike. Walter A. Zarzycki is commander. Joseph E. Yavrick adjutant and public relations officer. Bulldozers began this week preparing the McGuinness boulevard property at St. Stan’s American Legion Post for construction at a new headquarters off Nassau Avenue. Lopat Brothers will provide music. Members will entertain. Richard Fitzgerald co-chairman Joseph Vaurick is entertainment chairman. The Annual Carnival of St. Stan’s Memorial Post will take place three weekends, Sept. 13 – 14, and 15; Sept. 20, 21 and 22; and Sept. 27, 28 and 29. This will be a different format this year. 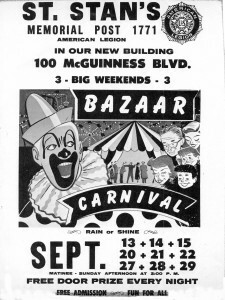 In the past the carnival was run for 10 days straight. The gala dinner and dance affair held Aug. 11 was a tremendous success. The Post was graced with the presence of many legion and local dignitaries, particularly Kings County Com-Commander Paul Palumbo. The St. Stanislaus Memorial Post 1771, American Legion, is holding its annual September Legion Fair today, Friday through Sept. 24. 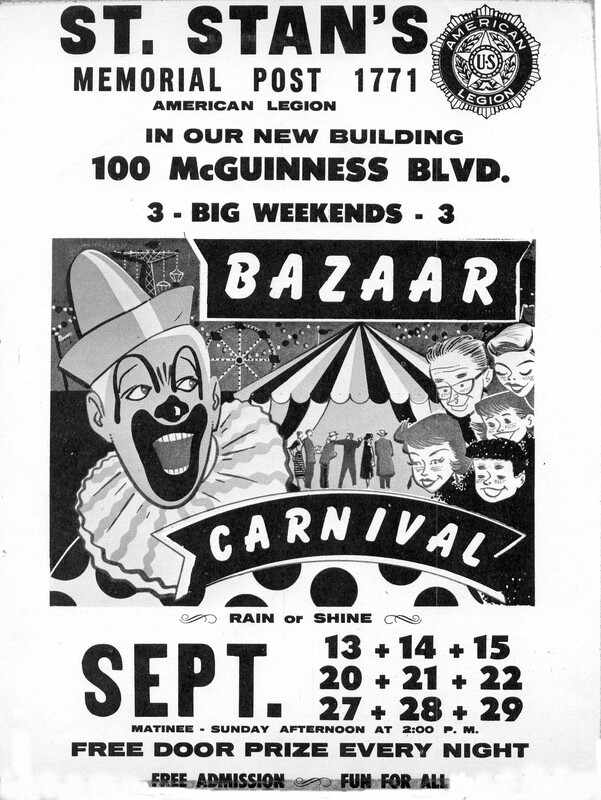 The Legion Fair will take place on the Post Grounds at McGuiness boulevard, between Nassau and Norman avenues: Admission is free. The post has rides for young and old, plus nightly prizes. As part of the Post’s Child Welfare program, it will give out free candy. The chairman of the carnival is past post commander and present vice-commander of Kings County American Legion, Richard Fitzgerald. St. Stanislaus Memorial Post 1771, American Legion, has announced its calendar of events for the remainder of its calendar year and also for the beginning of the 1970-1971 Legion year. Headlining in March will be the Post’s annual St. Patrick’s Irish Night, which will take place March 7. The chairmen for this affair are John Brady, Sonny Crescente , Phil Spizuoco, Stanley J Lowicki, Commander Walter Zarzycki. Information regarding tickets and reservations may be, obtained by calling any of the members. The rest of the Irish I Night committee consists of Harold McCollum, John Monlagano, John Lutz, Buddy Grady and George Weimmann. This affair is set to get underway at 8 p.m. at Post headquarters, 100 McGuinness, Boulevard between Nassau and Norman Avenues. Music for listening and dancing will be provided by the Lopat Brothers. There will be a hot meal served, followed by a late buffet and the donation of $7.50 per person also incubuses refreshments. A number of door prizes will also be awarded. Patrons are reminded to please call early for reservations. On March 15, The Post will conduct its 20th Annual Memorial, Mass, honoring its deceased members who have made the supreme sacrifice. As in the past The Memorial Mass is preluded by a march of Post Members, Kings County Delegations of the American Legion, combined colors of Kings County American Legion Posts, The Auxiliaries, Sons of the Legion and honored’ guests. The Mass is celebrated at St. Stanislaus Kostka R.C. church on Humboldt Street at Driggs Avenue. Chairman and Acting Chaplain Alfred T. Mizgalskihas indicated that a route of March is in the planning, stage and will be announced in short order. Citizens of the Greenpoint area are asked to please display their flags on this occasion. Further information will be announced shortly. Other significant events that are forthcoming are the land improvement Dance on May 2, the spring carnival from May 13 through May 17 and from May 20 through May 24, The Italian Night on June 13, The Polish Night October 3 the past Commander Night on November 14. St. Stanislaus Memorial Legion will have its official opening and dedication of their new post headquarters located at 100 McGuinness Boulevard between Nassau and Norman avenues on October 13th at 2 P.M. The afternoon’s program will be highlighted by the blessing of the building by the local clergy and also the attendance of local political figures and dignitaries from the Kings County Staff of the American Legion which includes Kings County Commander Paul Palumbo. Chairman and Adjutant Joseph E. Vavrick and co-Chairman, and Commander Walter Zarzycki announced the public is cordially invited to stop in for a visit to look over the building and join the members with a cup of coffee and donuts. “By this gesture, we sincerely hope we can further solidify our excellent relations with the citizens of Greenpoint and explain on a more personal note, the programs which we have earmarked for present and ‘future implementation and how we can be of further service in providing our citizens and our veterans in their respective requirements, ” said Zarzycki. 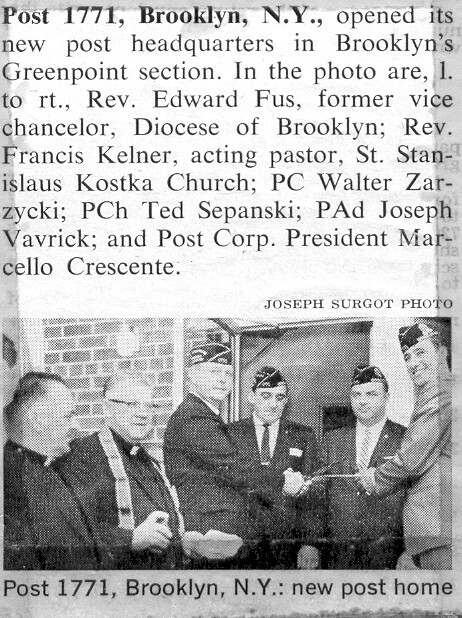 On October 13, St. Stanislaus Legion held its official blessing and dedication of its new post headquarters, located at 100 McGuinness Boulevard, between Nassau and Norman Avenues. Joseph E. Vavrick was chairman and Commander Walter A. Zarzycki co-chairman. The program was a tremendous success of the relations between the citizens of the local area and the Legion itself. The Rev. Francis X. Kelner of St. Stan’s Parish blessed the building and in attendance was the Rev. Edward Fus, former vice chancellor of the Brooklyn Diocese and presently pastor of Holy Cross Church Maspeth, who, was a special representative of Bishop Francis J. Mugavero, of the Brooklyn Diocese. Other notables at this affair were Paul Palombo, Commander of Kings County American Legion along with the entire staff of Kings County Officers and their impressive color guard. Also Frank Creta, Democratic. Leader of the 35th A.D. Assemblyman and Chester Straub, Eward Anderberg, vice president of the Green Point Savings Bank and Marcello Crescente, president of the Post’s building corporation. Congratulator telegrams were received from Congressman John J. Rooney, and Senator Edward Lentol, Edward Duffy of the Greenpoint Post A.L. and at present 1st Division Commander also took a bow. Later in the afternoon Mr. and Mrs. Michael Kecki, of radio station WLIB came. In conclusion Mr. Varick extended his deepest gratitude to all who came and said he was extremely proud of Greenpoint as a community for the splendid amount of people who at attended.